Has your Ford car key stopped working? Have you lost your Ford Remote Key? Locked out of your Ford and need urgent roadside assistance? Lost Your Ford Car Key and Need A Replacement or Spare? 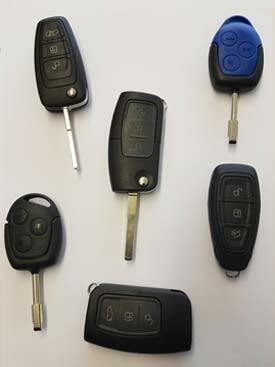 We are a leading vehicle locksmith - supplying, cutting and programming a range of Ford car keys. We can supply, cut and program flip remotes and keyless remotes for the following Ford models - KA, Fiesta, Mondeo, Locus, S Max, C Max, B Max, Galaxy, Cougher. Eco Sport, Edge, Kuga, Transit, Transit Connect, Transit Custom, and Ranger. We pride ourselves on providing the most reliable service possible, available when you need it.. We are able to assist 24 hours of the day, 7 days a week and can provide roadside assistance to get you back on the road as fast as possible. As well as replacement keys and remote controls, we can also open your car doors if you are locked out, provide vehicle locksmith services on the roadside, change Ford lock combinations and remove broken keys from a number of different types of Ford ignitions and door locks. If your Ford car key has been lost or stolen, and could be used to enter your vehicle, we can quickly delete all information from your car, so the lost key will never work again. Our Ford vehicle locksmith services are available across the Midlands, including Shropshire, Staffordshire, Herefordshire and Worcestershire. This includes all major cities, such as Birmingham, Coventry, Wolverhampton, Stoke-on-Trent, Solihull and Worcester.